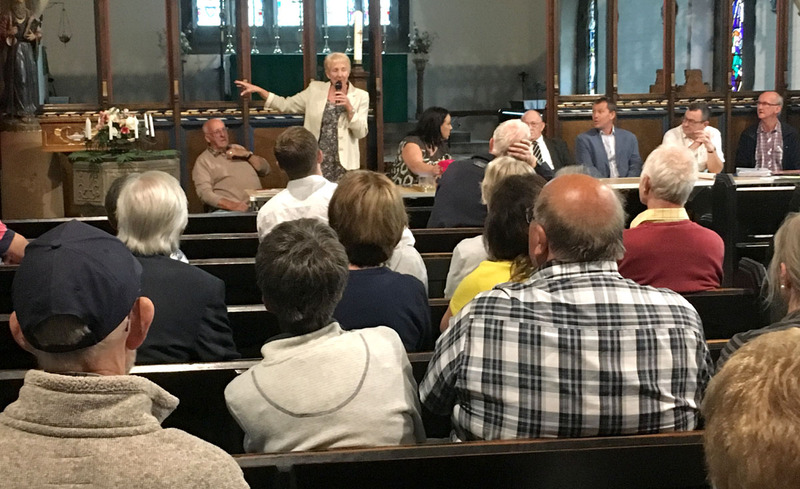 Around 40 to 50 people attended the public meeting for an update on the Bypass campaign, held in Flockton Church from 6:30 pm on Friday 15 June 2018. Although the Police and a representative from Highways weren’t able to send a representative (they were invited), Paula Sherriff, MP, was able to make it to the first 30 to 40 minutes of the meeting, which ended at about 7:45 pm. Our three local Councillors were also present, presenting cross-party unity in support of a bypass for Flockton. Left to right: Jimmy Paxton, Kathryn Middleton, Paula Sherriff MP, Cllr Bill Armer, Cllr Richard Smith, Cllr John Taylor, David Rawling. 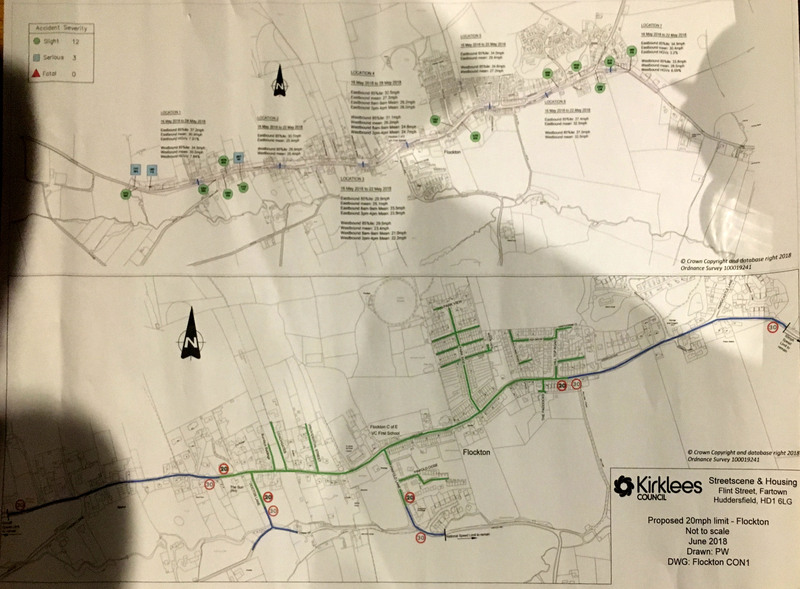 Paula Sherriff met with [Mr] Jesse Norman, MP (Parliamentary Under Secretary of State for the Department for Transport) – whom she described as being “a reasonable man” – on 21 January 2018 to mention Flockton Bypass. On 12 March 2018, a submission was made in respect of the Major Road Consultation. On 30 April 2018, Paula had a further meeting with Jesse Norman. Paula also said that we have to keep nibbling away and persevering. Nothing major will happen overnight as we are well aware. Everyone can play their part by reporting issues etc. There have been problems enforcing the no access for HGVs from the Grange Moor end of the village. Basically, the Police are waiting for the TRO (Traffic Regulation Order) to be revised which has, in effect, not allowed them, or the Council, to do what was intended when first introduced in the early 70’s. The 4 week closure (see further down this page) will have them undertaking very lengthy diversions! An opportune time to get them backing our campaign, in case of any future issues in the village. A number of residences have had either near misses with vehicles, or been hit by parts of vehicles. It is important to report all ‘issues’ or events to the 101 emergency number, so that they can be recorded. This way, the Police will be able to build up a ‘map of hot spots’. 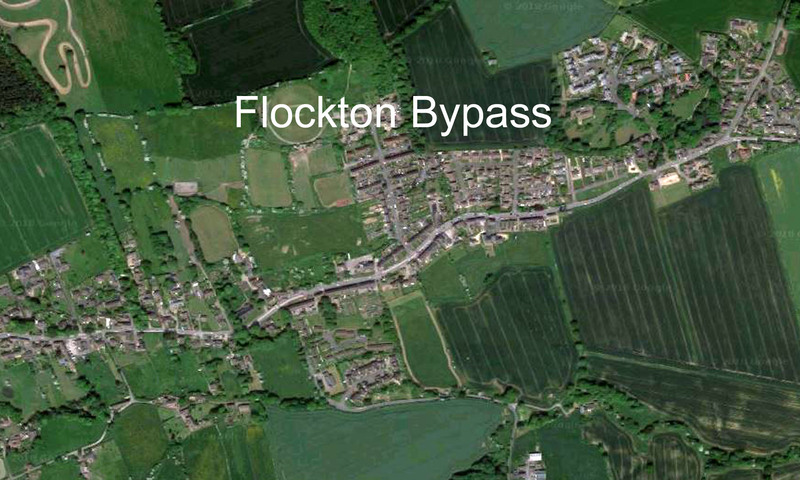 You can also send details (and any photos) which can be added to this Flockton Bypass website. (Apologies for the shadows, but I snatched this photo in the subdued lighting of the Church). If you click on the map, it will enlarge, and if you download it, you should be able to enlarge it further. It was pointed out that a full stretch of 20 mph through the village wouldn’t be possible, as from the Grange Moor side, you couldn’t drop a limit from 50 mph down to 20 mph in one go. Similarly, 40 mph down to 20 mph from the other end of the village would have the same issue. Furthermore, a protracted stretch would add to congestion, rather than easing the situation. We were informed that the road through Flockton, from the Sun Inn, to Haigh Lane, will be closed for 4 weeks from 30 July 2018. Judging by the audible gasps in the audience, this came as a surprise to most present. The closure is connected to the need to revamp and improve, the sewage system connecting the new builds. During this period, residents will still have access to their homes, but lorries and regular through traffic will be turned around by 24/7 ‘Gate Keepers’ posted at The Black Bull, Midgley and Grange Moor roundabout. (It wasn’t made clear, how they were going to turn HGVs around at the Black Bull, whilst also preventing them from driving down through Netherton). Currently, no solution to allow regular buses has been proposed. In addition to the sewage system, other work will be carried out by utilities and services, at the same time, including new street lighting. Kirklees have been in contact with Wakefield Council to inform them of the closure as it will impact on roads in their district too. All residents will shortly be receiving a letter re the closure etc we understand. Although not intended to trivialise this situation, John Taylor suggested that this might be a good time for any residents with road-side property, to undertake any renovations, since applying to encroach on roads or pavements for scaffolding can cost around £3,000. It was widely agreed that a proper professional feasibility study is required for the village. This would take into account everything to do with road suitability, pavements, traffic, economic viabilities, and so on. The only thing preventing such a study from being commissioned, is money!